*Every week, I’ll take a look at Big Ten’s current landscape, recap the previous week and analyze how the next seven days will impact the teams' NCAA Tournament hopes. With Michigan and Ohio State losing home games this week, Michigan State is in control of the Big Ten. All the Spartans have to do is win one of their two games this week (at Indiana, vs. Ohio State) to win the outright Big Ten Championship. Wisconsin's win over Ohio State led to Bo Ryan doing some shuffle dance while saying, "Let's... get... on... the... bus!" For almost all teams, this week will be about seeding in the Big Ten Tournament. The Spartans pretty much have the No. 1 seed** locked up, although Michigan could technically grab the top seed. Ohio State still looks like it'll be the No. 2 or No. 3 seed in the conference tournament and Wisconsin should be the No. 4 seed with very winnable games this week (home against Minnesota and Illinois). Illinois and Purdue are tied for fifth while Iowa and Northwestern are seventh and eighth. It might not seem important, but the conference tournament is all about matchups. **If there is a 3-way tie between MSU, OSU and Michigan for the Big Ten Championship, things get complicated. Tiebreaking for Big Ten Tournament seeds is interesting and actually states that "2-0 is not better than 1-0." Therefore, the only way Michigan State doesn't get the No. 1 seed (and Michigan does) is if somehow Northwestern (7-9) passes Purdue (9-7) in the conference standings. If that happens, Michigan's 2-0 record vs. Northwestern would win out against MSU's 0-1 record. If the tournament started today, the seeds would be as follows: 1-MSU, 2-OSU, 3-Michigan, 4-Wisconsin, 5-Purdue, 6-Indiana, 7-Iowa, 8-Northwestern, 9-Illinois, 10-Minnesota, 11-Penn State, 12-Nebraska. MAJOR STUMPER: Ohio State. The Buckeyes win this award for the second straight week, thanks to a disappointing home loss to Wisconsin on Senior Day. The Buckeyes are way to talented to have six losses before March, but chemistry seems to be an issue. It wasn't at the start of the year, but something just isn't right for Thad Matta's team. If Ohio State sweeps trips to Northwestern and Michigan State this week, the chemistry issues might never be brought up again, but keep an eye around all things happening in Columbus, as the Buckeyes look much more like a No. 2 seed susceptible to a second-round exit than a Final Four favorite these days. MAJOR SURPRISE: Purdue. Major props to the Boilers for being the first team to win at Crisler Center this season. The fact Purdue did it convincingly says this team might be peaking at the right time. Purdue has won four of five, the only loss coming at home to Michigan State. 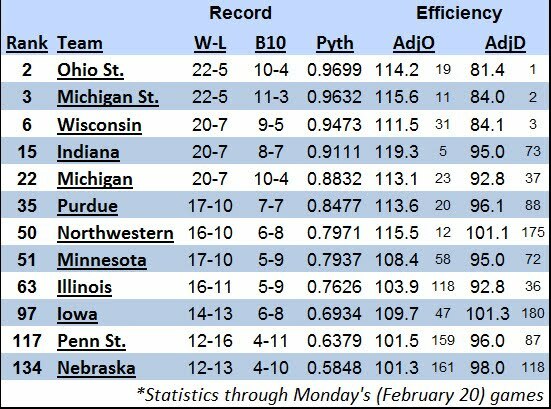 Throw in an 87-84 loss to Ohio State and Purdue's offense might be clicking well enough to win the Big Ten Tournament. BRACKETOGRAPHY: Last week's edition of Bracketography 2012, seven Big Ten still held firm in the field, but Northwestern is on very thin ice. If the Wildcats get it, it'll be because of better wins (Seton Hall, Michigan State) than other bubble teams. Michigan State has a real shot at the third or fourth No. 1 seed, but it has basically locked up a No. 2 seed at this point. Ohio State's recent troubles could drop Ohio State to the No. 3 line, but at this point the Buckeyes seem pretty comfortable on the No. 2 line. This week's loss to Wisconsin pretty much killed OSU's chances for a top seed. Despite the loss to Purdue, Michigan continues to be a safe bet for a No. 3 seed on Selection Sunday. The body of work is there. Wisconsin and Indiana are both No. 5 seeds and, depending on how each team's season concludes, could both bump up to the No. 4 line and a protected seed. Purdue was a No. 8 seed, but I actually have the Boilermakers as a No. 6 seed today. The win at Michigan was bigger than most people think and, the way Purdue is playing now coupled with early-season win over Temple is still a great win. Northwestern is the final Big Ten team in the field, snuggling nicely in the Play-In Game. The bubble is so weak that even if Northwestern loses to Ohio State this week it might still be in the field. I'd suggest winning one more "big" game to be safe, but who knows if that'll matter. Illinois needs to win out to even be in the NCAA Tournament discussion. A win against Iowa, albeit at home, was very important. Now the Illini need to beat Michigan at home on Thursday and wins at Wisconsin to get to an important 8-10 in the Big Ten. Those wins would be two big ones and could prove to be "ticket-punching" victories. Michigan State now leads the Big Ten by a game over Ohio State and Michigan with Wisconsin a game behind. Those seem like the top four seeds in the Big Ten Tournament for sure. The order, however, has yet to be determined. Ohio State 83, Illinois 67: This game wasn't nearly as close as the final score. Needing a win in any way possible, the Illini played like a team worthy of the Big Ten cellar. Michigan 67, Northwestern 55 (OT): The Wildcats might still make the NCAAs due to the very weak bubble this season, but this win surely would have helped. With a chance to win in regulation, Northwestern couldn't sink a dagger. In overtime, Michigan hit back-to-back-to-back triples to begin the extra session, putting the game away. Michigan State 66, Minnesota 61: Michigan State couldn't have played worse, but Minnesota gagged the game away by sinking just one field goal over between 10:20 and 2 seconds left in the second half. In fact, the Golden Gophers didn't hit the rim in the final 3:20 other than a meaningless triple with 1.8 to play. This loss killed the Gophers NCAA hopes. Purdue 78, Michigan 61: So much for Michigan closing out the regular season with an unblemished home record. The Boilermakers can out on fire from 3-point range while the Wolverines had trouble shooting much of the night. This game locks up Purdue's spot in the big dance. Wisconsin 63, Ohio State 60: Something troublesome is happening in Buckeye land this season. While Ohio State is 23-6 and still in line for a No. 2 seed in the NCAA Tournament, Jared Sullinger is mentally checking out during games and some players seem more focused on improving individual NBA Draft stock than running Matta's offense. Give Wisconsin credit for playing its game and getting a major road win. Northwestern is still clinging to its NCAA hopes while Illinois and Minnesota are NIT bound. This week is all about seeding in the Big Ten Tournament. Tuesday, Feb. 28 - Michigan State @ Indiana: Michigan State can clinch an outright Big Ten Championship with this win. Indiana still has a shot at a bye in the Big Ten Tournament, but it would need some help from Wisconsin's opponents. This game could be more about MSU locking up a No. 1 seed in the NCAA Tournament and Indiana possibly getting a No. 4 seed, however. Wednesday, Feb. 29 - Ohio State @ Northwestern: A classic "win and you're in" game. At some point, Northwestern needs another signature win and this one would be better than many other bubble teams could claim. The Buckeyes still have a shot at a Big Ten co-Championship by winning this game, having Indiana beat MSU on Tuesday and winning at MSU on Sunday. There is a lot riding on this game for both teams. Sunday, March 4 - Ohio State @ Michigan State: There could be a lot riding on this game or nothing, depending on the mid-week results. The Buckeyes are looking for revenge while Michigan State could strengthen its case for a No. 1 seed in the NCAA Tournament. Every week Chris presents the new bracket projections and I follow with its predictions. This week's games made quite a difference in the pairing and what the results could be. Most surprising upset: No. 8 Kansas State over No. 1 Duke. This might be the most surprising any way you draw it up; how can a bubble team knock off Duke with its great 3-point shooting, guard play, and some good size in the front court? Anything is possible. VCU took down mighty Kansas last year with the perimeter shot. I was primarily trying to get something other than all No. 1 seeds in the Final Four and with Kansas State's stranglehold on Missouri (swept the Tigers this year), a similar team relying on the outside shot, the Wildcats could do the same against Duke. Other notable upsets: No. 6 Wichita State over No. 1 Missouri (similar to Kansas State over Duke), No. 5 Vanderbilt over No. 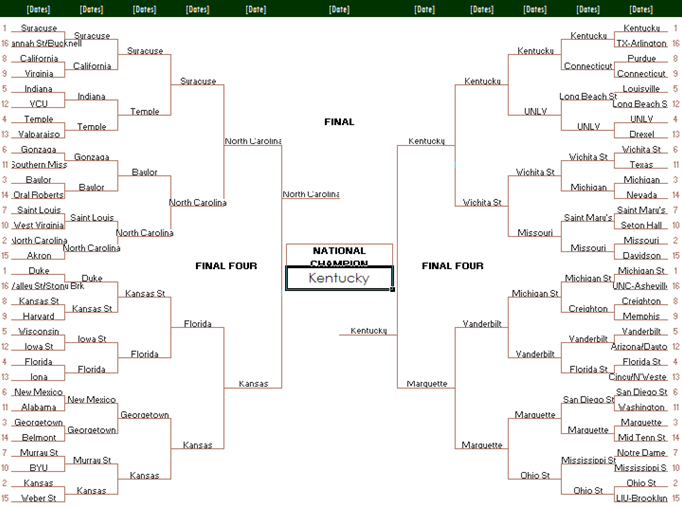 1 Michigan State (opposite of previous stated scenarios). Least surprising upset: It's difficult to find one here. A lot of the upsets that occur could be argued as very surprising, but I'll stay with my post from a few weeks ago about Louisville and Long Beach State. The Cardinals are struggling and Long Beach State, albeit a buzzer-beater loss in Omaha to Creighton, is still very dangerous. Darkhorse Final Four contender: No. 1 Missouri, with its balanced scoring, could potentially get to the Final Four with relative ease if the shots are falling. No. 1 Michigan State and No. 2 Ohio State are teams that can get to New Orleans by slowing down the tempo and forcing shots from opponents. Michigan State's Draymond Green is providing almost 40% shooting from beyond the arc while Ohio State's Jared Sullinger and Aaron Craft are two weapons the Buckeyes use in their scoring. A complete darkhouse could be No. 5 Vanderbilt, but they too rely on the perimeter shot for much of its scoring. Festus Ezeli has been good but not great since his return from a season-opening suspension. Other notable games: No. 5 Indiana vs. No. 12 VCU; No. 3 Baylor vs. No. 2 North Carolina; No. 1 Syracuse vs. No. 1 North Carolina; No. 6 New Mexico vs. No. 3 Georgetown; No. 7 Mississippi State vs. No. 2 Ohio State; No. 12 Long Beach State vs. No. 4 UNLV. Champion: Kentucky. It seems as if the title is Kentucky's to lose; the Cats overcame a 13-point deficit on the road at Mississippi State last Tuesday and won by nine. Their stifling defense has forced teams to shoot field goals at only a 37% clip. Marquis Teague is turning into the point guard John Calipari wants for this offense and it's paying off. Senior Darius Miller is making his presence felt in late-game situations with key scores. So far 29 teams have played Kentucky, several teams get Kentucky rattled, and only one has won (Indiana on a last-second shot). I don't see this train stopping anytime soon. Minnesota fans had seen this horror flick before. In fact, it was eerily similar to a forgettable event on the same day in 2011. Despite holding a 9-point lead with 10 minutes to go, the Golden Gophers knew the Spartans weren't dead. And thanks to some shaky ballhandling and absolutely no composure under pressure, Michigan State finished the game on a 14-3 run for a 66-61 victory. (Minnesota had just two field goals in the final 10 minutes, the last being a meaningless 3-pointer with 1.8 seconds to play). Ironically, the script was almost identical to the game from Feb. 22, 2011 - exactly one year earlier. With 3:41 to play in that game, the Spartans trailed the Gophers, 47-39. MSU won thanks to some clutch play down the stretch, 53-48. In 2010, Minnesota led MSU for most of the game at Williams Arena. With 4:47 to go, the Gophers had a 62-58 lead, one that was already dwindling thanks to a disappearing offense and some come-alive play from Kalin Lucas. Lucas made all of his shots in the second half, including a go-ahead 3-pointer with 1:27 to play as the Spartans escaped with a 65-64 victory. Like the previous two instances, Wednesday's game was won with defense. That said, it wasn't a pretty defensive effort; it was just more timely. The Spartans surrendered more than a point per possession, even with Minnesota turning the ball over 15 times. Below is the Defensive Score Sheet for the game. (For clarification on the numbers, what they mean, and how they're calculated, read this post). The most important number is each player's defensive rating (DRtg). Its calculations project if "Player X" was on the floor for 100 of his team's defensive possessions, how many points the opposition would score. Keep in mind the team's overall defensive numbers play a huge factor, but even small variances from the team's DRtg are significant. 1. The fact MSU won with horrendous defensive games from Draymond Green and Keith Appling says a lot about this team. It was clear during the game that Day-Day was missing some energy, especially on the defensive end. He was late on switches and allowed Rodney Williams some basically uncontested and easy looks in the paint. Appling seemed to be single-handedly killing MSU's comeback chances. After receiving a technical foul - which MSU blogger Chris Vannini does a nice job discussing here - that resulted in two freebies, Appling fouled two jump shooters which "gave" the Gophers five more points from the charity stripe. It's crazy how, even with Appling bailing out Minnesota with seven points that the Gophers still choked the game away. 2. Derrick Nix and Adreian Payne, or the more likeable combo name Derrick Payne, both had great games in the post. 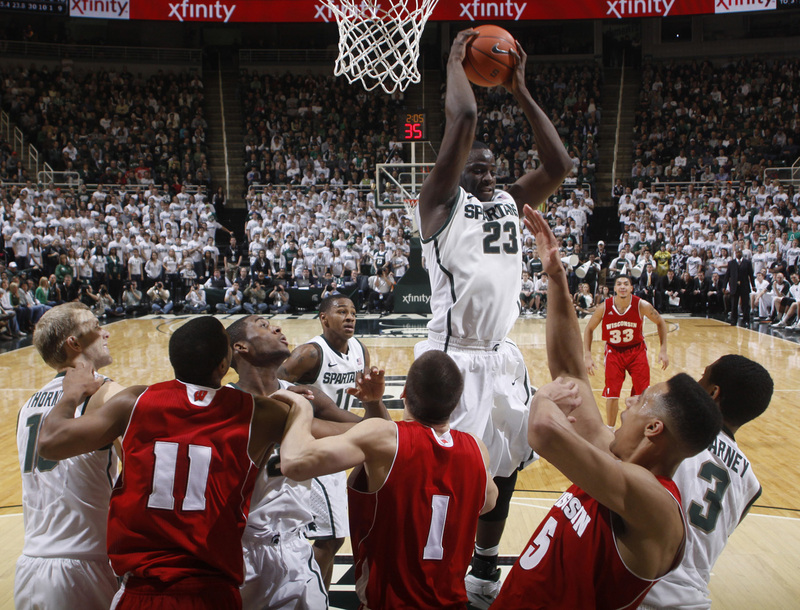 Usually one of MSU's bigs has to protect the rim but not both. With Green and Appling both struggling, the key to victory might have been both of MSU's centers providing much energy on defense. Yes, Ralph Sampson III dropped in a few beautiful hooks and a couple turnaround Js, but none of the looks were easy. 3. Austin Thornton didn't let his disgusting offense turn into repulsive defense. While he contributed nothing offensively (0 for 5 shooting including 0 for 4 from 3-point range), Thornton did a nice job on whoever he guarded. Whether it was Joe Coleman or Rodney Williams, neither could put the game away and much of that credit goes to the fifth-year senior who is finally realizing his role. Michigan State took sole possession of first place in the Big Ten this week, thanks to rival Michigan knocking off Ohio State on Saturday night. What's extremely impressive about MSU's chances at a conference championship is the notably difficult schedule. The Spartans only play Iowa, Illinois, Northwestern and Penn State once (teams currently in 7th, 8th, 10th and 12th place in the conference), meaning two games against every other contender. Teams like Michigan (avoid playing at Wisconsin), Ohio State (avoid playing at Purdue) and Wisconsin (avoid Purdue at home and Michigan on the road) have at least one scheduling "relief." That isn't to take anything away from those teams and their chances at a Big Ten Championship. What it should do, however, is illustrate how Tom Izzo is in the middle of one of his best coaching jobs at Michigan State. MAJOR STUMPER: Ohio State. The Buckeyes won a nice road game at Minnesota, but the lack of continuity on offense was evident in the 56-51 loss to Michigan. Sure, some of Ohio State's issues would be solved if a few more 3-pointers - many being pretty decent looks - started falling again. Nevertheless, every possession that Jared Sullinger doesn't touch the ball in the post is a wasted possession. There were way too many of those against the Wolverines. All of a sudden, the Buckeyes don't look like a Final Four team. In fact, the best comparison would be last year's Texas team that was ranked No. 1 for a while and a February title favorite. Then came a late-February slump which preceeded the Longhorns slipping to a No. 4 seed in the NCAA Tournament before an early exit. MAJOR SURPRISE: Michigan State. With the way the Spartans have played as of late, nothing - not even a NCAA title this season - should surprise people about Michigan State. What is surprising is how dominant MSU has been on defense. When Purdue scored 62 points on Sunday, it was the first time since a January 14 loss at Northwestern that MSU had allowed more than 60 points in a game. Keep in mind MSU plays at around 67 possessions - the NCAA average - per game, not at Wisconsin's walk-it-up pace. Therefore, holding opponents to fewer than 60 points when the Spartans ideally like to push the tempo is incredible. 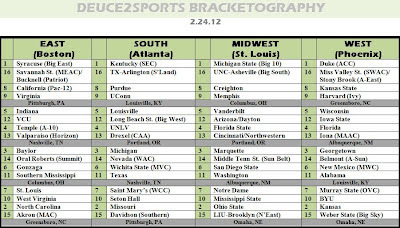 BRACKETOGRAPHY: Last week's edition of Bracketography 2012, seven Big Ten still held firm in the field, but one team continues it slide to the NIT. Michigan State and Ohio State headlined the group, both securing No. 2 seeds. Michigan State also has the inside track on a No. 1 seed if the Spartans win out or, at worst, claim a non-shared regular season Big Ten Championship. Ohio State still has a great resume, but recent problems have the Buckeyes trending downward. It's unlikely Ohio State drops past the No. 2 line, but crazier things have happened thanks to some surprising deep runs by teams in conference tournaments. Michigan continues to surge and looks like a pretty good bet to fall on the No. 3 line on Selection Sunday. Wisconsin and Indiana are both No. 5 seeds and, depending on how each team's season concludes, could both bump up to the No. 4 line and a protected seed. Purdue was a No. 8 seed and looks pretty safe at this point barring a collapse. The Boilermakers have good wins and are playing great in recent defeats to the Big Ten's best. Illinois' overall resume is still better than a lot of bubble teams, but wins against Gonzaga, Ohio State and Michigan State - all at home seem like eons ago. The Fighting Illini are clinging to an No. 11 seed and have lost eight of nine games. The lone win in that stretch was a never-watch-the-game-film-again 42-41 win against Michigan State. Since last Friday's bracket, Illinois was blown out at Nebraska, 80-57. At 5-9 in the Big Ten, Illinois needs to win three of its final four Big Ten games to be in the NCAA Tournament discussion. An 8-10 Big Ten team would get serious consideration, especially with Illinois' remaining schedule featuring games at Ohio State, Iowa, Michigan and at Wisconsin. Northwestern got a nice win over Minnesota and, believe it or not, the entirely weak field might be enough for the Wildcats to slip into a "First Four" game. We saw a few 14-loss teams make the tournament last season, so it wouldn't be shocking to see the same happen this year. 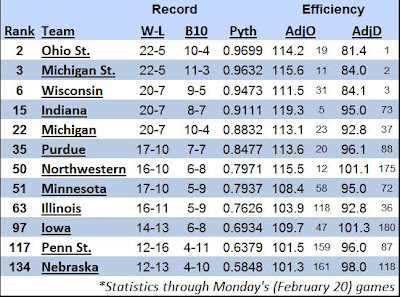 Below is a snapshot at where Big Ten teams stack in Ken Pomeroy's rankings. THE WEEK THAT WAS: Michigan State now leads the Big Ten by a game over Ohio State and Michigan with Wisconsin a game behind. Those seem like the top four seeds in the Big Ten Tournament for sure. The order, however, has yet to be determined. Ohio State 78, Minnesota 68: Ohio State got a nice road win to avoid what would be presumed as a total collapse in the Big Ten race. Purdue 67, Illinois 62: The Illini got down early and the fight to win the game was too much. Purdue won this game playing its best ball of the year and before Kelsey Barlow was dismissed from the team for the rest of the season. Purdue plays hard enough on most nights that it looks like a tournament team, albeit it one that stays a short time. Michigan State 69, Wisconsin 55: The Spartans dominated this game from start to finish, leading by 21 points at one point. This shouldn't discount how good Wisconsin is, just how well the Spartans are playing at this moment. Michigan 56, Ohio State 51: College GameDay saw Michigan play well enough and Ohio State miss enough 3-pointers for Michigan to climb within a game of the Big Ten lead. It's tough to discount how well Michigan played, but Ohio State's problems seem to be more internal (selfishness on offense, communication problems) than external (how well the opponents are playing). 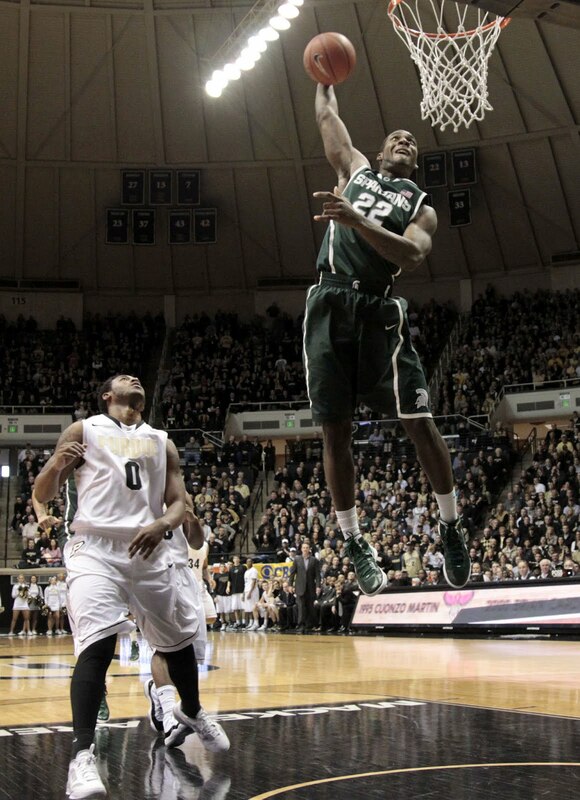 Michigan State 76, Purdue 62: Playing without two starters, Purdue came out on fire offensively and led at halftime. But when the Spartans found a solution, it was evident who the better team was. MSU held Purdue to 1-for-21 shooting from the field to open the second half to push the lead to 16 points in another big road win for the Spartans. THE WEEK AHEAD: How will Illinois, Minnesota and Northwestern respond to a win or enjoy the NIT scenario. Tuesday, Feb. 21 - Illinois @ Ohio State: The Buckeyes are 16.5-point favorites in this game. That should tell you, as bad as Ohio State has played of late, how bad terrible Illinois has been. This win would save Illinois' season. Tuesday, Feb. 21 - Michigan @ Northwestern: The Wildcats squandered a nice lead and lost, 66-64, in overtime to the Wolverines earlier in the season. Northwestern needs this game and is actually a 2.5-point favorite. Both teams play similar styles and it's a game Michigan can afford to lose in terms of NCAA seeding. If Michigan wants to win the Big Ten Championship, however, this game can't be lost. Wednesday, Feb. 22 - Michigan State @ Minnesota: The Buckeyes just went into the barn and won and Minnesota couldn't recover to beat Northwestern on the road. It's desperation time for Tubby Smith's Gophers. Road games haven't scared the Spartans as of late and MSU dominated the early-season meeting. This is crucial to Minnesota's NCAA Tournament hopes. Saturday, Feb. 25 - Purdue @ Michigan: This should be a game with plenty of 3s. The Boilermakers will have played two games without Kelsey Barlow at this point and D.J. Byrd will have one game under his belt. The team that shoots the triple better wins a game that might, surprisingly, be played in the 70s. Sunday, Feb. 26 - Wisconsin @ Ohio State: The motto for both teams here will be simple: If you want to keep a Big Ten Championship dream alive, just win, baby! Should be a low-scoring classic in Columbus. Not many teams have had as bad luck against any opponent as Purdue has had against Michigan State this season. Before the teams' previous meeting, Purdue had a "Planes, Trains, and Automobiles" reenactment, arriving via bus to East Lansing a mere two hours before tip off. The result was a 25-point blowout. Saturday morning, about 36 hours before the teams were set to play the rematch, D.J. Byrd was arrested for public intoxication. Later, Byrd - a 3-point assassin who had been playing his best ball of the season - was suspended for the game and Kelsey Barlow, who had been given a "next strike and you're out" warning, was booted from the team. Purdue fought valiantly for a half, leading the Spartans by three at the break. MSU turned up the defense in the second half, forcing Purdue to miss 20 of its first 21 shots in the second half in what turned out to be a fairly comfortable victory. Below is the Defensive Score Sheet for the game. (For clarification on the numbers, what they mean, and how they're calculated, read this post). The most important number is each player's defensive rating (DRtg). Its calculations project if "Player X" was on the floor for 100 of his team's defensive possessions, the number of points the opposition would score. Keep in mind the team's overall defensive numbers play a huge factor, but even small variances from the team's DRtg are significant. 1. Draymond Green was sensational, as usual. Green forced 9.5 misses, forced more than a third of Purdue's turnovers and was a pest defensively all night. Green spent a lot of the afternoon guarding Ryan Smith, no doubt playing a major role in Smith's 3-for-11 shooting game. 2. As @KJonthebanks coined, and says is mandatory for MSU victories, "Derrick Payne" had a monster game. The combination of Derrick Nix and Adreian Payne creates a 40-minute college superstar with a variety of talents. Nix's big body, especially defensively, allows him to force a post-feed catch off the block. He's then perfected the wraparound poke, creating key turnovers. Payne, on the other hand, doesn't have the girth to push his man off the block, but his length and shot-blocking and shot-altering tendancies make it difficult to get good looks at the rim. The duo combined for a nice game defensively. Obviously, Purdue lost JaJuan Johnson to the NBA draft and with seemingly no Big Ten talents in the low post, the Derrick Payne duo did what it should have done to the Boilermakers: dominate defensively. All you need to know about Michigan State's 69-55 victory vs. Wisconsin is this: MSU shot 30-for-59 from the field, becoming the first team all season to top the 50 percent mark against the Badgers. In a limited-possession game, the Spartans had major offensive spurts fueled by fastbreak baskets. 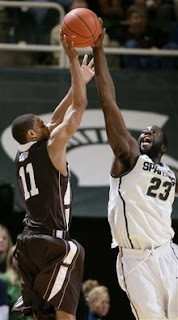 A 15-0 difference in fastbreak points was the major difference in the game - one the Spartans played almost flawlessly. Defensively, the team numbers don't look spectacular, but they're somewhat inflated due to Wisconsin getting a handful of buckets in garbage time late in the game. At one point, the Spartans held a 21-point lead. You know how hard it is to get a 21-point lead against Wisconsin? In many cases, that would mean holding Wisconsin scoreless for an entire half because the Badgers only surrender 53 points per game. 1. 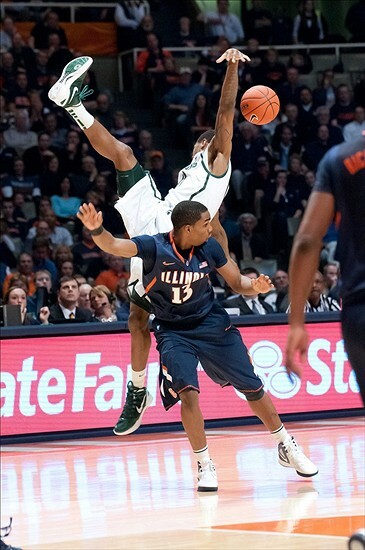 Branden Dawson continues to be a freshman sensation defensively. The Badgers only took 3.5 shots against Dawson, but that's mostly because whoever he was guarding -usually Josh Gasser but occasionally Jordan Taylor - couldn't get a decent look at the basket. Dawson continues to be the defensive X-factor that makes Michigan State so good on the defensive end. 2. If not for Ryan Evans being the only Badger athletic enough to create his own shot, Draymond Green would have had spectacular numbers. Much like Green did to Michigan's Zack Novak, Evans made unguardable fadeaway jumpers against Green much of the game. It was another sensational game on the glass for Green, who has become an expected double-double guy. 3. Dane Fife can sure coach 3-point defense. Unbeknownst to many, Dane Fife left a head coaching job at Indiana-Purdue Fort Wayne (IPFW) to join Tom Izzo's staff this season. One of Fife's main responsibilities has been 3-point defense. After being one of the worst teams in the country last season at defending the 3-pointer, MSU is now one of the better teams in the country. Against a team like Wisconsin that uses its bigs to shoot the three, defending the triple is arguably the biggest key to victory. MSU held the Badgers to 5 of 24 from beyond the arc, and two of those triples came in Wisconsin's faux comeback attempt after it was down by 21 points late. 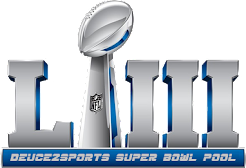 Every week Chris presents the new bracket projections and I follow with its predictions. This week’s games made quite the difference in the pairings and what the results could be. 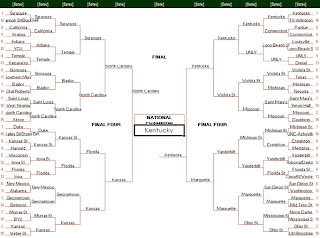 Most surprising upset: Several upsets are listed on the bracket, but none greater than the wins accumulated by No. 6 Wichita State. In this bracket, not only do I have the Shockers beating a down Baylor team, but also a Duke team that has momentum from two comeback wins this past week. Wichita State’s win over Davidson (albeit another mid-major) showed me that Gregg Marshall's team is not afraid of anybody. The Shockers have already clinched a share of the Missouri Valley regular season title while having a great inside-out game with seven-footer Garrett Stutz guarding the paint and Toure’ Murry leading the charge from the perimeter. A mentally lost Baylor team should be a good test for the Shockers before they ‘shock’ the world (sorry, had to do it) against Duke. Least surprising upset: No, I won’t repeat myself about Wisconsin. The bracket does that for me. But, I will not be surprised if No. 12 Long Beach State takes out No. 5 Louisville in their rematch game. The 49ers traveled to Louisville earlier this year and lost by thirteen. Louisville has improved since then with Gorgui Dieng becoming a defensive threat and gaining Wayne Blackshear from injury. Long Beach State, on the other hand, has endured arguably the toughest non-conference schedule of any contending team. Their narrow loss in the BracketBusters to Creighton (in Omaha) only builds their toughness and confidence to win games on larger stages. The Beach gets revenge on the Cardinals. Hello to another early round exit for Rick Pitino. Darkhorse Final Four contender: I have Michigan State moving to the Final Four over Missouri, but it was a difficult decision. I’d have Missouri, Duke, and North Carolina in Final Four contention based on the matchups. Missouri is the best fit though; they could be considered the ‘fifth’ Final Four team in this bracket. Duke and North Carolina have not shown me that they have staying power this year. Both have glaring weaknesses that will be addressed come March. A true darkhorse could be Georgetown. They have impressed me with their 10-4 record in Big East play. Wins versus Notre Dame and at Marquette to close out the season could mean more chances for a late March push. Other notable games: No. 3 Georgetown vs. No. 2 North Carolina; No. 8 Creighton vs. No. 9 Harvard; No. 5 Florida State vs. No. 4 Florida; No. 1 Ohio State vs. No. 2 Kansas; No. 5 Saint Mary's vs. No. 12 Mississippi State; No. 6 Vanderbilt vs. No. 3 Michigan. Champion: Kentucky. The Wildcats continue their winning ways in the SEC, sitting a perfect 12-0 including rolling over Florida and a late squeaker versus Vanderbilt (in Nashville). Kentucky senior Darius Miller and freshman Kyle Wiltjer have been key in coming off the bench as of late. Miller’s solid defense and zone penetration skills combined with Wiltjer’s outside presence could mean “8pril” for the Cats (their eighth title in April). Syracuse poses great size matchups with Kentucky but with several narrow wins over Louisville, Georgetown, West Virginia, and Cincinnati, I question their ability to handle such an atmosphere. Kentucky wins 79-71. A memo to all fans of teams seeded No. 7 of better in the bracket: Your teams are very, very safe. However, at-large teams in the 8-13 range will drive their respective fans nuts until Selection Sunday. While I still think Kentucky is the country's best team and its one loss (a buzzer beater at Indiana) is better than Syracuse's (double-digit defeat at Notre Dame), the more I've studied recent selection committees the more I realize that Syracuse would get the edge for the overall No. 1 seed. Depending on the source, the numbers can be conflicting. 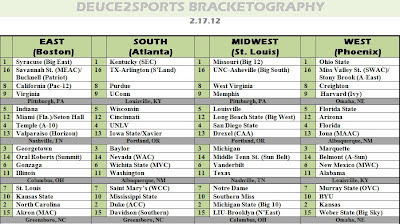 However, the NCAA's most recent "Nitty Gritty" sheet has Syracuse's nonconference SOS at 29 while Kentucky's is at 101. With all else being fairly equal, that's been enough to nudge one team ahead of another. Missouri and Ohio State are the other two No. 1 seeds, though Kansas has the best shot at usurping either team's spot. Another team to watch is Michigan State. If the Spartans win the Big Ten regular season outright, including a sweep of Ohio State, I'd be shocked if the Spartans aren't rewarded with a No. 1 seed. At this point, MSU boasts a nation-best six wins against ranked teams and seems very much set for a floor of a No. 2 seed barring some craziness. Baylor's slide - albeit it against the Big 12's best - continues to hinder it's chances for a top-2 seed. While I still think Baylor's overall resume is very good (wins against San Diego State, at BYU, at Northwestern, Saint Mary's, West Virginia) but my guess is North Carolina and Duke will nab the final pair of No. 2 seeds. Biggest Risers: New Mexico (No. 9 to No. 6), Louisville (No. 9 to No. 5), Purdue (No. 12 to No. 8). I've been riding the New Mexico bandwagon for weeks now. (My history will show the Lobos in the 8/9 game for the past three weeks). Leading the Mountain West Conference and coming off a big win at San Diego State gets the Lobos a deserved jump. Louisville went though a much-detailed slide a few weeks back, but the Cardinals have been rolling since. Even a 1-point loss at home to Syracuse comes across as a big plus for Rick Pitino's team. Louisville was more of an 8-seed last week but moved for seeding rules and this week makes a big jump. Few teams have been more impressive, especially offensively, than Purdue the past week. Giving the Buckeyes all they could handle in Columbus and winning at Illinois, coupled with other wins looking better, and Purdue jumped four seed lines. (NOTE: With news Kelsey Barlow has been dismissed from the team the selection committee will look at how Purdue plays from here on out. D.J. Byrd, another starter, has been suspended for the team's game against Michigan State on Sunday. The next few weeks will determine if Purdue can stay afloat in the NCAA Tournament discussion). Biggest Fallers: Alabama (No. 8 to No. 11), Kansas State (No. 7 to No. 10). Both these teams have okay resumes but neither is winning games right now. When push comes to shove, teams that win down the stretch will play their way into the tournament. Kansas State and Alabama need to find some wins - against anybody - to feel safe. LAST 4 TEAMS IN: Seton Hall, Iowa State, Miami, Xavier. LAST 10 TEAMS OUT: NC State, Northwestern, Minnesota, VCU, Stanford, Northern Iowa, Oregon, Saint Joseph's, Dayton, UCF. NOTES: While the Horizon league looks like it will only get one bid, it is a great race to follow. Valpo holds the league lead right now as Cleveland State slipped up twice this week, but Detroit and Butler are both streaking. I might be the only one, but I'm getting excited for the Horizon Conference Tournament in early March. Wichita State is going to be one of the most dangerous teams in the tournament, regardless of seed. Many experts (Ken Pomeroy, ESPN's new BPI, etc.) all have Wichita State as a Top 12 team. Well, most people are seeding Wichita State in the 6-8 range. Heck, voters didn't even get the Shockers into the Top 25 this week! This is a Sweet 16 team just waiting to be the next mid-major to crash the Final Four. While I actually moved the Shockers down a line this week (No. 5 to No. 6), that was more due to other teams re-building their respective resumes.